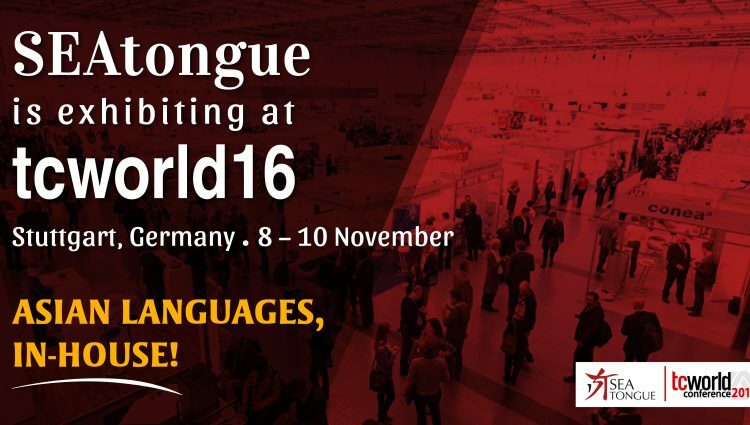 Home News SEAtongue is Exhibiting At The Tcworld Conference 2016! Join SEAtongue at Stand Foy03, as part of the Asian Pavilion in this exciting tcworld conference. Held in Stuttgart, Germany between 8th and 10th November 2016, it is the largest industry event for technical communication and welcomes companies from a wide range of industries who appreciate the value of good technical communication in business success. Having industry leaders from all over the world, the event will be a prime opportunity for networking, strengthening partnerships and meeting potential customers. Since being founded in 2006, SEAtongue has grown to be a leading translation company in Asia. With bases in Japan, Malaysia, Indonesia, Vietnam, Thailand and Philippines and in-house linguists across Asia, it provides client-centered reliable services delivered by local experts at competitive prices. SEAtongue offers a comprehensive one-stop localization service that includes translation, software/website localization, desktop publishing and software testing. Its production team has proven experiences in a wide array of industries with easy access to a large local network of linguists in Asia. The event is organized by tcworld GmbH and Gesellschaft für Technische Kommunikation and will be held at the International Conference Centre next to the Stuttgart Airport.